This is similar for Gradle, Ivy and Buildr. The version must be exactly the same as the optaplanner-core version used. XStream and XML in general is a very verbose format. Reading or writing large datasets in this format can cause an OutOfMemoryError and performance degradation. 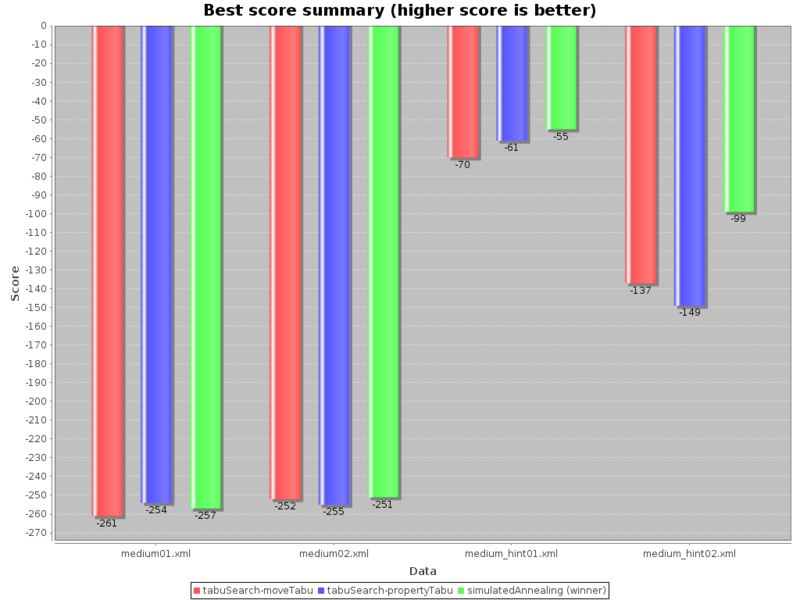 Shows the best score per inputSolutionFile and solver configuration. 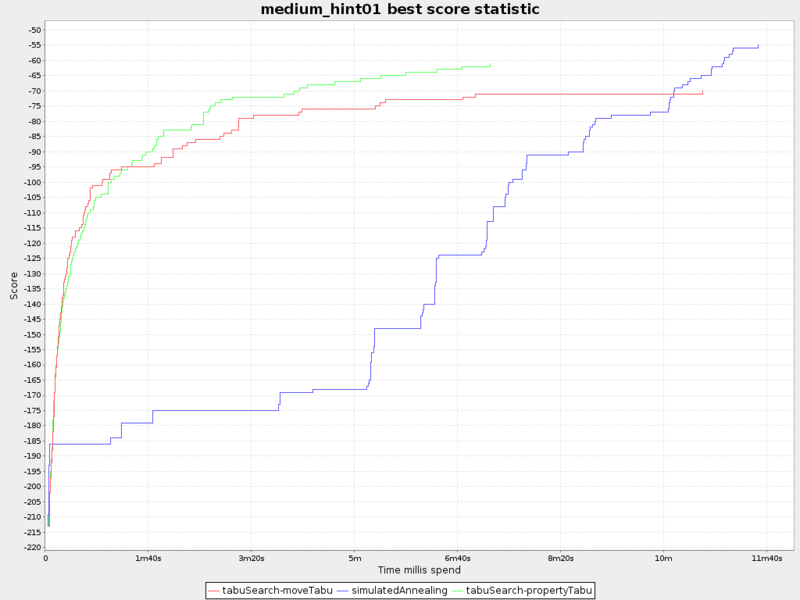 To see how the best score evolves over time, add BEST_SOLUTION_CHANGED as a problemStatisticType. The best score over time statistic is very useful to detect abnormalities, such as score traps. Don't be fooled by the simulated annealing line in this graph. If you give simulated annealing only 5 minutes, it might still be better than 5 minutes of tabu search. That's because this simulated annealing implementation automatically determines its velocity based on the amount of time that can be spend. On the other hand, for the tabu search, what you see is what you'd get. 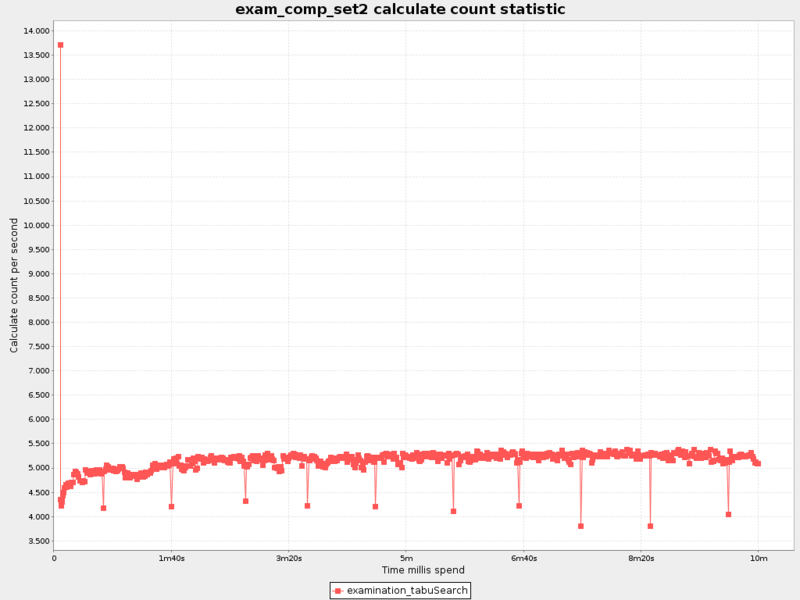 To see how fast the scores are calculated, add CALCULATE_COUNT_PER_SECOND as a problemStatisticType. The initial high calculate count is typical during solution initialization. In this example, it's far easier to calculate the score of a solution if only a handful exams have been added, in contrast to all of them. After those few seconds of initialization, the calculate count is relatively stable, apart from an occasional stop-the-world garbage collector disruption. 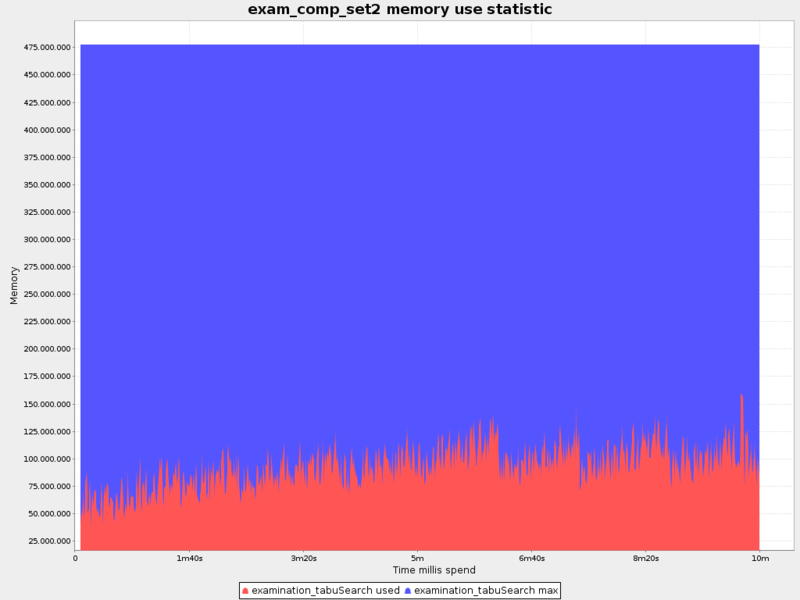 To see how much memory is used, add MEMORY_USE as a problemStatisticType. Matrix benchmarking is benchmarking a combination of value sets. For example: benchmark 4 planningEntityTabuSize values (5, 7, 11 and 13) combined with 3 acceptedCountLimit values (500, 1000 and 2000), resulting in 12 solver configurations.